Today the Iraqi parliament finally passed a long-awaited modification of the provincial elections law of 24 September which adds special representation for certain specified ethno-religious minorities in certain areas. The process towards agreement on these changes has been a tortuous one, involving basic disagreements on issues such as state structure and federalism, identity questions, and gerrymandering of key electoral constituencies. To get a sense of what has been at stake in this, it may be worthwhile to revisit the first version of the provincial elections law that was adopted on 22 July 2008. In its article 50, 13 minority seats were specified, roughly half of which were in the Kurdistan region and Kirkuk and another three in Mosul, with two seats specifically reserved for Yazidis and Shabak. While Kurdish objections against the law at the time above all focused on the contentious article 24 (which envisaged radical power-sharing in Kirkuk) it is easy to see that article 50, too, was a formidable challenge against the Kurdish position. In the first place, it legislated detailed arrangements for the distribution of seats in the Kurdistan Regional Government (KRG) area. The KRG position is that the Iraqi parliament does not possess authority to make any decisions on those “internal affairs of Kurdistan” which are not enumerated in the constitution as shared powers or the exclusive powers of the federal government (hence, the “decision” to exclude Kurdistan from the next elections is not something that has been explicitly incorporated in the latest version of the elections law – as misreported by many news agencies – but rather a decision by the Kurdish leadership to ignore it in practice.) Secondly, the specific mention of Yazidis and Shabak was seen as provocative by many Kurds, who often consider these peoples as Kurds with different religious and linguistic traditions. Some Kurds want to assimilate these groups under a wider pan-Kurdish umbrella, and areas inhabited by Yazidis and Shabak are annexation targets of the KRG. The next version of the elections law, adopted on 24 September, focused on achieving some kind of modus vivendi on Kirkuk and thereby scrapped the whole issue about minority representation. This was followed by an outcry by Iraqi minorities and especially Christians, with swift declarations of solidarity from the entire Iraqi political spectrum from the Kurds to the Sadrists. It should be stressed in this context that there is a big difference between minorities and micro-minorities in Iraqi politics. Special representation for larger ethno-religious groups is frowned upon by most Iraqis except the Kurds. It is for this reason that ethno-religious quotas for Arab Shiites and Sunnis (and the grey-zone case of the Turkmens, who mostly but not always prefer to compete within the national framework) are dismissed as muhasasa and objectionable emulation of the Lebanese system. Conversely, special representation for the very small groups, is a time-honoured tradition which in the case of the Christians go back to Ottoman system when the only formal distinctions were between Muslims, Christians and Jews. The same logic has gradually become accepted with regard to the Yazidis and the Sabaeans, and, in this last case, also the Shabak – a Shiite-majority group in northern Iraq whose language is similar to Kurdish but which claims to have a tradition and history as a distinctive ethnic group. During most of October, it was believed that the final clauses on minority representation would follow closely the proposal by the UN special representative in Iraq, Staffan de Mistura. In its latest incarnation, this plan envisaged the creation of 1 special seat in Basra (for Christians), 4 in Baghdad (3 for Christians and 1 for Sabaeans) and 7 in Mosul (3 for Christians, 3 for Yazidis and 1 for the Shabak). On 30 October, the Kurds – who had hitherto strongly opposed the designation of the Shabak as an independent group and on more than one occasion described this as a plot to divide the Kurdish nation – expressed satisfaction with this kind of arrangement. 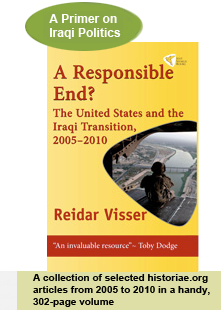 Another report suggested that it was supported by both the Kurds and the Islamic Supreme Council of Iraq (ISCI). Also other members of the parliament expressed support, like Khayrallah al-Basri, a Wifaq representative from Basra who said it took some persuasion for the Sabaeans to accept the idea that they would be represented in Baghdad but not in their historical homeland in the south. However, in today’s version of the bill, different ideas prevailed. Yesterday, press reports suggested that the rest of the parliament had challenged the Kurds and ISCI and the de Mistura proposal, and instead wanted a decrease in the number of seats. And in the bill that was adopted today, minority representation has been cut by fifty percent. There is still one Christian seat in Basra, but no more than one Christian and one Sabaean seat in Baghdad, and one Christian, one Yazidi and one Shabak seat in Mosul. A myriad of motives seems to have been involved in this process. For example, Iraqi nationalists have been divided as to whether the minorities should have special representation at all or should aim at becoming included through non-sectarian parties. Similarly, Christians have been divided as to the methods for calculating their number of seats and defining their identity: some want to have a common “Assyrian” ethnic identity for all of Iraq’s Christians, others – such as some of those who prefer to call themselves Chaldeans – tend to focus on their denomination which thus becomes more easily compatible with a wider Iraqi identity. 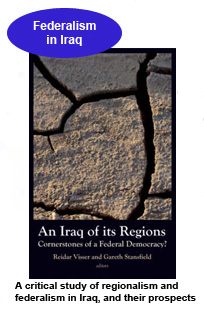 But above all, perhaps the contest over minority representation is best understood as an attempt to gerrymander the forthcoming elections in the hotly contested Nineveh governorate. In Basra and Baghdad, the minority quotas are so small compared to the total numbers of seats on the provincial councils that they are unlikely to have any major impact on the formation of the next provincial governments. Conversely, Mosul and the Nineveh area is home to many minorities, and if for example 12 seats had been agreed, it would have been almost a third of the members next provincial council. It is in this context the Kurdish change of position makes sense. The Kurds moved from intransigence on the question of recognition of Shabak identity to espousing the de Mistura proposal with 1 Shabak and 3 Yazidi seats, and with one Shabak member of parliament affiliated with the Kurdish parties even proposing 3 seats for the Shabak. Apart from the obvious advantages of staying on good terms with de Mistura, it seems that the Kurdish calculation has been that they might be able to stack these seats with pro-Kurdish representatives in a governorate where they have territorial ambitions, as they have also done in Kirkuk where nominally Arab and Turkmen representatives who owe their loyalties to the Kurdish parties serve as “Arab” and “Turkmen” representatives in the local government. The Kurds today expressed dissatisfaction with the rejection of the de Mistura plan, and it is likely that they were among the 50 or so representatives that voted for de Mistura and against the proposal that eventually prevailed. Instead, those who wanted to reduce special minority representation overall won the day as 106 representatives voted for the new version of the law. 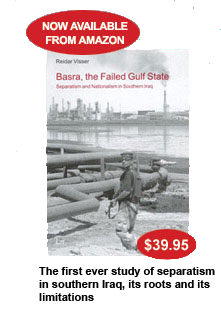 At the time of writing it was still unclear whether ISCI had abandoned the Kurds in the last minute and joined with other representatives in adopting the more limited quotas. As late as yesterday, reduced quotas were seen as the alternative to the ISCI/Kurdish/de Mistura position (Daawa members, for example, had been advocating one seat only per community), although the battlefronts were far from clear-cut. Kurds did identify the nationalist “forces of 22 July” as an opponent in the battle, but there have also been examples of both members of Iraqiyya and Sadrists expressing themselves in favour of the proposal by de Mistura. The intricacies of the matter are perhaps best indicated through recording the position of Hunayn al-Qaddo. Qaddo is a Shabak who originally was elected on the United Iraqi Alliance (UIA) list but who at times has expressed sympathy for the more nationalist 22 July front. Fiercely critical of Kurdish attempts to assimilate the Shabak, he was also angry about the decision to exclude minority representation from the 24 September version of the minorities law. However, in a television interview with al-Furat on 25 October he praised the position of UIA in confronting the Kurds, and especially highlighted Hadi al-Amiri of the Badr brigades for protecting the position of the Shabak. Today, some Christians have complained that they are the victims of an Arab–Kurdish struggle (and called for a presidential veto of the law), whereas Qaddo’s supporters have celebrated the designation of a Shabak seat as a triumph for their small community, expressing satisfaction that they got one seat and that none of the other minorities got more than that. To them, at least, this was first and foremost about fending off the Kurdish challenge.